Orange County Fire Rescue went head-to-head with Central Florida law enforcement at the Amway Center during the recent Guns N’ Hoses charity hockey game to support St. Baldrick’s Foundation, a nonprofit organization focused on funding research to identify cures for childhood cancer. This is the second year that Orange County Fire Rescue has participated in the friendly hockey game. 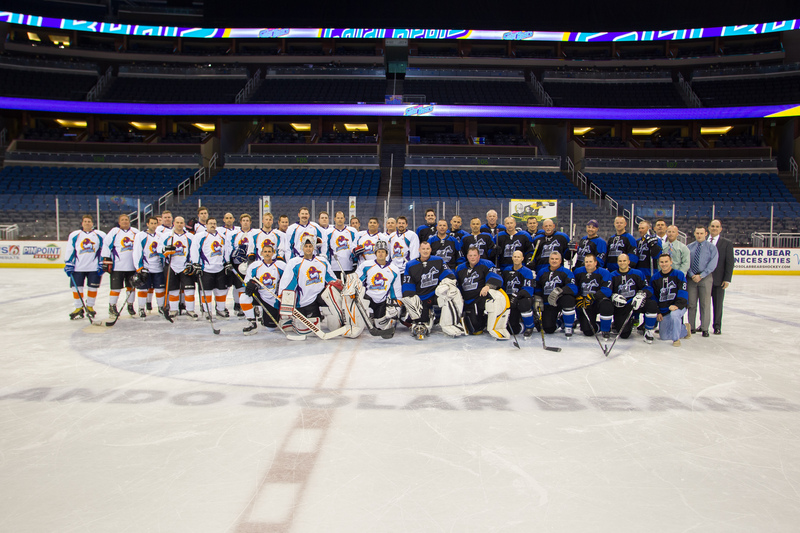 The face-off between Orange County firefighters and the Central Florida Enforcers, composed of a group of law enforcement officers from the region, was held prior to the Orlando Solar Bears game. The Orlando Solar Bears are a professional ice hockey team that plays 36 regular season home games at the Amway Center. The Fire Rescue honor guard kicked off the celebration and firefighter Oscar Negron sang the national anthem prior to the game. The Central Florida Enforcers won the game with a score of 4 to 3. View photos from the game on Flickr. For more information on recruitment at Fire Rescue, visit Orange County’s website. Citizens are also encouraged to follow @OCFireRescue on Twitter for breaking news and updates from Orange County’s Fire Rescue Public Information Office.